They are the most popular door types and still so complex. Trust the service of your overhead door in Airdrie to us to be sure of its safe operation. Backed with years of on the job experience, our local techs can fix sectional doors effectively. Irrespective of its special characteristics, opener features, brand, or size, your overhead door will be fixed right. Not only do we repair these types of doors at our Garage Door Repair Airdrie company, but also sell and install them. If you care to buy a new door, trust the quality of both our pr oducts and services. Whenever you are looking for experts to routinely inspect and maintain the existing door, depend on our thorough work. We are here for any overhead garage door service in Airdrie, Alberta, and guarantee prompt response, excellent work, and competitive prices. Got issues with some overhead garage door parts? Contact us. Whether it’s apparent that the spring is broken or don’t how why your door is acting up, rely on our repair expertise. When our pros come for service, they come prepared to deal with any issue. Since all members of our team are well-equipped and knowledgeable, they can troubleshoot and repair your overhead door effectively. Since overhead doors can be dangerous if they are not installed or serviced right, trust our company for any service. We do any needed overhead garage door repair in a timely fashion. Whether the door won’t close or the cable must be replaced, our tech will tackle the issue as fast as possible. We have experience with torsion and extension springs, service all openers, and can replace any part in a jiffy. Overhead garage door maintenance is the right service for the avoidance of problems and thus accidents. Call us to service your door every year, check the opener, run some tests, lubricate the parts, and make the necessary adjustments. 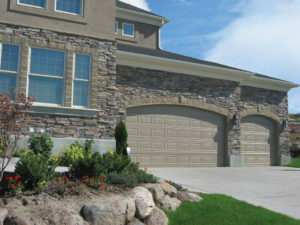 We are experts in our work and provide professional Airdrie overhead garage door services promptly and affordably. Contact us if you need help with your overhead door.